Daksha. Brahmas's son, had a beautiful daughter named Sati who loved Shiva and wanted to marry him. Daksha considered himself to be greater than Shiva and forbade her. But Shiva and Sati married without his consent . One day, at a ceremony, Shiva did not stand up to pay his respect to Daksha. Insulted, Daksha vowed to take revenge. Daksha arranged for a yajna and invited all the gods expect Shiva. Sati was very hurt and went to meet her father at the ceremony. Daksha insulted Shiva in front of everyone. Unable to bear this, Sati threw herself into the sacrificial fire and died. 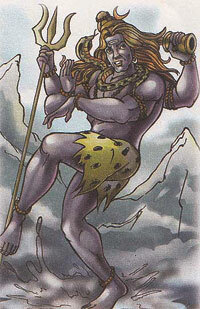 The enraged Shiva began performing the tandav or the dance of destruction, to destroy the entire universe. Brahma appeared and begged Shiva for forgiveness. Shiva relented but cursed Daksha that he would bear a goat's head forever. Sati was later reborn as Parvati.